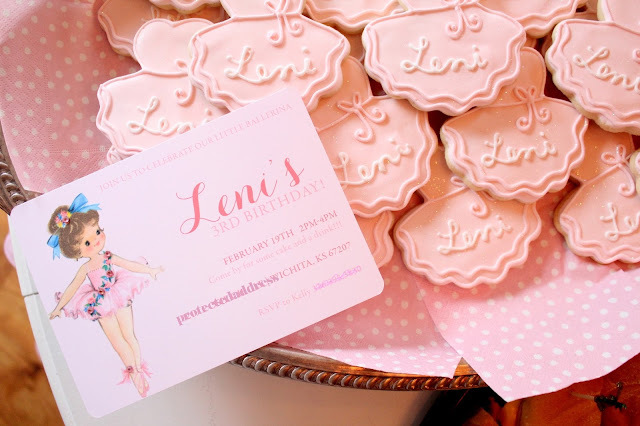 We are heading out of the shop on the blog today and sharing pictures from Leni's adorable ballerina birthday! Now that Leni is the big three, she is able to take ballet. My cousin, Kelly, wanted to celebrate her birthday with pink and tutus. Definitely an adorable theme for a little girl. For food, Leni wanted her local favorite, Barnards. That girl knows what she wants! Plus, the selection definitely went over well with her little party guests. I always love when parents let their littles give input on party details. Kelly also made some adorable marshmallow tutus to add a touch of ballerina to the food spread. There are different recipes for these on Pinterest. She picked up some pale pink plates and gold polka dot napkins at the shop to set out with the food. The masterpiece of the party table? Leni's ballet cake! Kelly went to her usual local favorite, Cheri's Bakery, and made her requests. It turned out beautifully and we didn't want to cut into it. I think Kelly shed a tear taking the first cut. For an additional dessert, Kelly ordered tutu cookies, which Leni also took to school to pass out. Both made for gorgeous table decor. Kelly got crafty for the party table, and made a tulle tutu skirt. It takes some patience and a lot of tulle, but the end result is adorable for a ballerina or princess party. She layered a ballerina garland from our shop on top. The different colored tutus on the ballerinas popped against the light pink tulle. I also had to snap a picture of Leni's adorable new ballet shoes - they're so small! For the invitations, we worked with a local designer I carry at the store, Gretchen with p.ink creative. She has this vintage ballerina design and it worked perfectly for the party. For a little flair, Kelly added pink rhinestone stickers to the ballerina. This little ballerina had a wonderful time dancing into the age of three! She was excited to party with her cousins and friends. Now we just need to get her into those ballet classes! Next session she will be ready. Pom pom tutu and all. I appreciate your article writing, here it is my first visit and I found a great information here.